The Art Now Gallery has been attached to a larger effort to “Support Chinese art now in China”. Could you please explain a little about this effort and what the motivations behind it are? 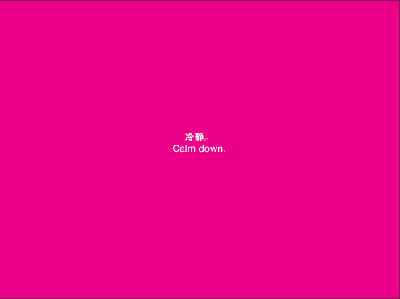 This is a temporary slogan I came up with based on the current situation in Chinese contemporary art. Massive numbers of classic Chinese contempary art pieces went abroad, and when Chinese art galleries and collectors realized their values, they had to spend much more to get these works back when we could have gotten them easily initially – just as the government is now spending massive amounts of money on buying the antiques back from abroad. Another reason is that I hope China can have its own art collectors. Only when national art collectors have matured, can there be real hope for Chinese contempary art. We can’t rely on others to do this work. BM: The Chinese government is generally portrayed in the foreign press as hostile toward contemporary art, but many of the people I’ve met in Beijing feel strongly that this isn’t a fair view. Having worked in the public sphere, I’m curious about your view on the government’s engagement with contemporary art. CC: China is now undergoing a transformation in the sense that the government has started to consider the positive impact of cultural activities. They are willing to put large of amounts of money into cultivating cultural life here, by paying for international exhibitions to come over and sponsoring exhibitions of Chinese artists abroad – starting from the ["Living in Time"] exhibition at Berlin’s Hamburger Bahnhof Museum in 2001. That was pretty much the beginning of the Cultural Ministry getting involved in [Chinese] contemporary art exhibitions overseas. Before they only sent Peking Opera and things like that. But after the exhibition in Berlin was such a success, not only in terms of the public’s response but also the collaborative governments from other countries, you started to see an immediate change in the approach to contemporary art, with the government involved in the [2003 Chinese contemporary art] exhibition at the Centre Pompidou, which was curated by [Fan Di'an] from the Central Academy of Fine Arts. And from there they started to really twist the scenario. Before that [the presentation of Chinese contemporary art] was dominated by non-Chinese born curators. So, when China started to get fully collaborative, it showed major progress.